Not exactly the most optimistic highlights to carry into a new year, are they? In a time where world leaders are not reaching even the lowest benchmarks for urgent climate policy, it is easy to feel hopeless in the wake of their inaction. If the people who are supposed to lead us away from climate disaster are failing to do so, how can we make meaningful progress towards a more secure climate future? 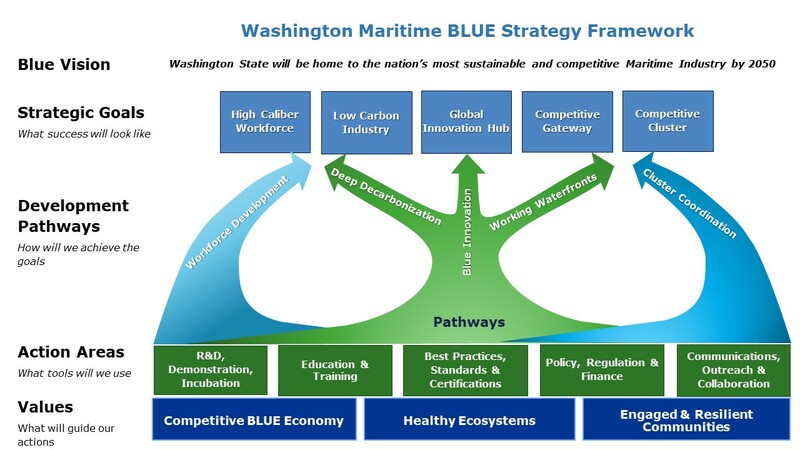 The Washington Maritime BLUE Strategy includes climate initiatives such as “deep decarbonization” and the creation of a low-carbon maritime industry. Photo credit: Washington Maritime Blue. While the US federal government is falling grossly behind as a world climate leader, there is a silver lining. Actors at the state level are stepping into the vacuum created by the federal government’s absence to move climate policy forward in the United States. Washington has emerged as a leader among the states, particularly in the maritime industry. 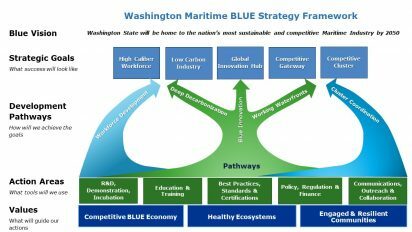 In 2017, Washington Governor and 2020 presidential candidate, Jay Inslee, launched the Washington Maritime Blue Strategy, a plan aimed at positioning the maritime sector of Washington State as the most “sustainable” in the country by 2050. Elements of the plan include implementing clean shipping technologies, equitable workforce development, and “deep decarbonization” of the maritime industry. Global shipping accounted for about 3% of the world’s greenhouse gas emissions from 2007-2012, and according to the International Council on Clean Transportation, fuel consumption is steadily increasing in the shipping industry. Inslee’s statewide maritime plan aims to greatly reduce Washington’s carbon footprint in the marine transportation sector and beyond. The M/V Tacoma is 1 of 3 ferries slated for conversion from diesel to electric power as part of the Washington State Ferries electrification plan. Photo credit: Wikimedia commons. The Washington Maritime Blue Strategy has only been in place for about a year, but big plans for decarbonization are already in motion. 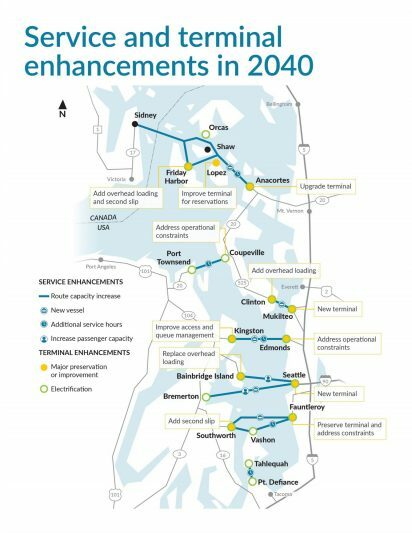 Notably, a state agency, Washington State Ferries, is unraveling its most ambitious project in agency history: ferry electrification. 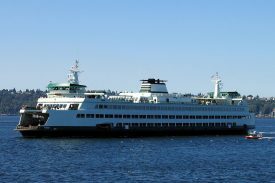 The plan is to convert Washington’s three largest ferries from diesel engines to battery-powered electricity by 2023. The agency currently operates 23 ferries which consume about 19 million gallons of fuel per year. 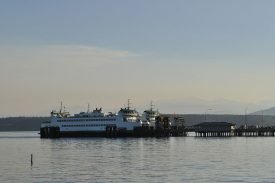 The three largest ferries, which run routes between Seattle/Bainbridge and Kingston/Edmonds, account for 5 million gallons of the annual total, or approximately 26% of the entire fleet’s diesel consumption. 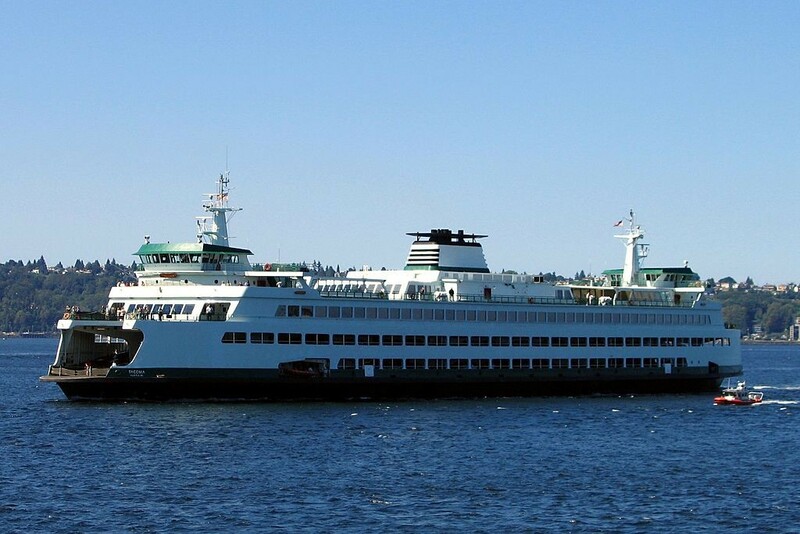 By converting these three vessels to electric power, Washington State Ferries expects an approximate net reduction of 75% in carbon emissions per ferry, according to the Director of Vessel Maintenance and Engineering, Matthew von Ruden. The conversion of each vessel is expected to cost about $30 million, on top of building new shoreline power stations, but the agency projects somewhere near $60 million in fuel savings in the first 40 years following the upgrades. The smallest of Washington State Ferries’ vessels is the Kwa-di Tabil class, which holds 64 cars. Pictured here is the M/V Salish and M/V Chetzemoka at the Port Townsend (WA) dock. Photo credit: Joe Mabel, Wikimedia commons. Those emissions reductions won’t be fully realized until each of the three ferries is converted to electric power and power charging stations are complete. Completion of those three vessels, the Tacoma, Wenatchee and Puyallup, is expected by July of 2021, 2022, and 2023, respectively, and the shoreside battery power stations should be fully running by July 2023. The vessels will first run as hybrids, using both electricity and diesel fuel, until the charging stations are fully functional. In addition to a new battery, the converted ferries will also include two diesel generators as emergency back-ups, in the event of power outages or battery malfunctions. The expected lifespan of the batteries is conservatively estimated at four years, and the average energy requirement to power the system is 2,200 kWh, with a cruising power of 7,200 kW. Washington State Ferries plans to continue reducing carbon emissions through fleet electrification beyond the largest vessels. Its long-range plan includes the conversion of the three Kwa-di Tabil class ferries, their smallest vessels which hold 64 cars. Additionally, any new ferries the agency builds will be all-electric or hybrid ships. A map of the expected updates to ferry routes and vessels described in Washington State Ferries’ long-range plan. Credit: Washington State Ferries. Co-benefits of ferry electrification include improved air quality as the volume of vessels’ emitted particulate matter is greatly reduced, and strict requirements for the management of stormwater runoff in the areas surrounding the shore power charging stations. 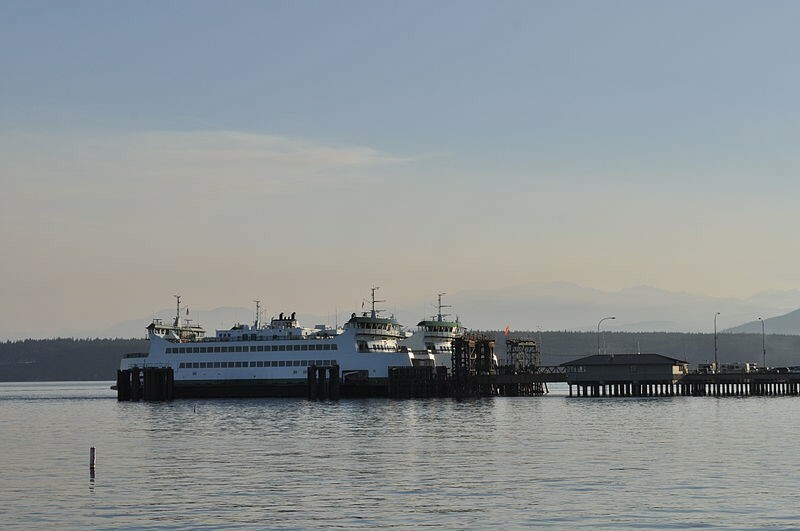 Since the adoption of the Washington Maritime Blue Strategy, Washington State Ferries has already initiated changes, unrelated to electrification, in its ferry operations to curb carbon emissions. One of the most effective ways to cut back on fuel consumption, according to von Ruden, is to simply slow down. By limiting ferry speeds, Washington State Ferries saved approximately 300,000 gallons of fuel from April to December 2018, amounting to a 5% savings. Fuel savings are expected to increase over time with the continuation of operational efficiency policies and the completion of ferry conversions. As we cruise into the beginning of 2019, there’s climate hope to be found in leadership outside of Washington, D.C. Ferry electrification is just one example of leaders making progress at the local level, and similar stories are emerging in maritime transportation across the globe. It’s easy to feel frustrated with large-scale climate inaction, but it’s important to also recognize small-scale climate victories right in our own backyards. We’re watching the future of clean and innovative marine technology unfold; what an exciting time to be alive.